Choose from any of our courses, fill in our onsite training quote form opposite and let us get back to you with your price. Still unsure whether onsite training will work for you? Call us on 01423 396780 and we’d be happy to advise you on your training needs. Before you book, make sure you have a suitable space large enough for all candidates to be seated. In addition, some courses which include practical elements will require adequate floor space. Working at Heights: Discover the truth behind the common myths. Level 2 Food Safety: Provide your food handlers with the knowledge required by law. There is no minimum amount of people you can book onto an onsite course. However, it may not be the most cost-effective method of training. Instead, it may make more sense to book onto one of our open course dates. Nevertheless, fill out the form above even if you are considering onsite training for a couple of employees. Then, we will get back to you with our quote and any recommendations. Where can I book for? 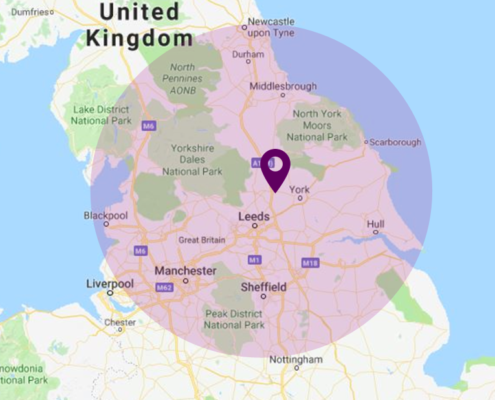 We offer our onsite training throughout Yorkshire and the North-East. The map above covers the regions we serve.